The latest addition to the wide ski market from K2 is an absolute blast. I was lucky enough to secure a pair of 174cm long Darksides from the new K2 Backside series. This series of skis was designed to combine the touring ability from Backcountry skis and alpine sturdiness from Sidecountry skis. From this can Mike Hattrups Backside series. Go to http://k2skis.com/news/2009/08/the-evolution-of-backside-adventure/ for the whole story and to see blog posts from around the world. The ski is the widest ski on the series at 154/128/144 and weighs in at 2100 grams in the 174cm length. The Darkside has a slightly rockered tip only and this allows for great versatility powder and on hard pack. 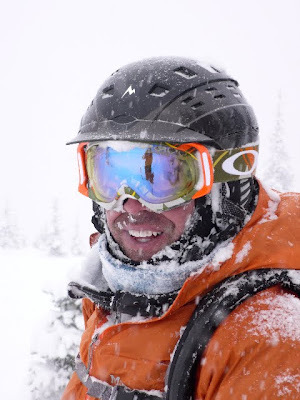 The ski has a wood core (Aspen and Paulownia blend), and uses the K2 Hybritech vertical sidewall technology (Simply traditional sidewalls for most of the ski and cap construction in the tip and tail). I have never skied a ski this fat and was curious as to how it would ski for me. The surprise came in how easy it was to ski. The groomers were not terrifying, nor did I feel I was on the verge of sliding to the bottom of the slope, and the ski was more agile than I imagined in powder. Would I recommend skiing the Darkside for a day of hard pack and groomers? No. Can you enjoy yourself on the way to your favorite Sidecountry stash or pocket of Powder? Absolutely. The Darksides truly shine in the soft snow. They make you feel as if skiing is effortless and simply more fun. It does take a bit to get used to how fast you can ski and that you will pop over crud and push piles instead of going through them, but it is a quick adjustment. This ski truly shines when you are skiing fast and full throttle in powder and I must admit to backing off before I reached the speed capacity of the ski. 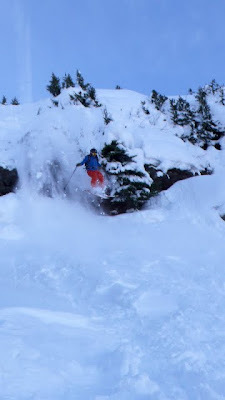 One of the great surprises of the ski was how well it skied in steep tight trees. The slightly rockered tip keeps the ski from diving and therefore you can turn with confidence. The landings from small airs in the trees also proved to be comforting in how predictable the ski behaved. The Colorado Mountain School also has a pair of 181 Darksides and two friends John Winsor and Winston Binch were able to take the skis on a few runs. They both loved the ski and commented it was as easy a ski as they had ever touched. In fact, Winston liked it so much he is looking to purchase a pair as are two friends of his. I will write shortly on the brake modification on Dynafit F-12’s to get a Salamon 130mm brake arm for the wider skis. Get out there and enjoy one of the great new skis from K2. I jumped on a pair of the Darkside's (size 181) last week for an amazing day of sidecountry skiing. I was impressed how well they handled while ripping groomers, negotiating moguls, and of course the pow stashes. They definitely like to go fast... which I like! But they also initiate a turn easily and carve fairly well for a pair of fat board. I'm hooked and can't wait to get back out on them again. The snow has just started to get deep in Colorado. So I should have a few more months to ride the on the Darkside! what about the ski brakes mod!? ey men I need to ask you something, in some more months I would go to pratice snowboarding, can you recommend some good brands to buy a good board, thanks for the information, by the way, I will be in Aspen Co, of course. I practiced cross country skii in Aspen, Colorado for around 3 years, but since moment I broke my leg I left this passion out my life.